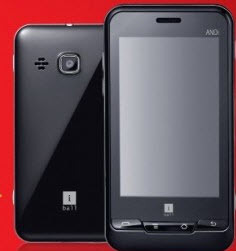 iBall company has recently launched it's first Android smartphone iBall ANDi in indian market. The iBall ANDi is a dual sim smartphone runs on Android OS and power is provided by 416MHz ARM9 processor. In this article we will read all smart and attractive feature, specification and what is actual price in india( including Bangalore, Delhi, Mumbai, Pune, Hyderabad, Chennai and other cities in India). First , the iBall ANDi comes with 3.2-inch capacitive touchscreen display with 240 x 320 pixels screen resolution. multi format music player, 3.2 mega pixels camera, video player, video recording, music player, FM Radio, 3.5 mm audio jack, internal memory which can be expanded up to 32GB through microSD slot card. This smat Android phone also supports 2G, Bluetooth, Wi-Fi, WAP, USB and PC Sync data connectivity and battery power is provided by 1000 mAh for long battery life and talk time.